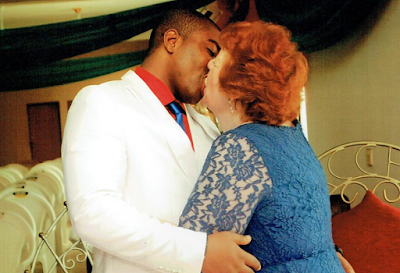 Locking lips with her hunky groom, Angela Nwachukwu beamed like a giddy teenager. But this was the ­pensioner’s third attempt at marriage — and her hubby is 45 years her junior. Angela, 72, had met CJ, 27, just three months earlier after he added her on Facebook. Her trip to Nigeria for their wedding was the first time they met face to face. But Angela insists CJ is her soulmate and since they married has spent £20,000 visiting him and trying to get him into the UK. The gran of six was ­devastated when CJ was denied a visa but says their marriage is solid despite the 4,000 miles between them. Angela, a retired taxi driver from Dorchester, Dorset, says: “CJ is the most caring man any woman could want to be with. “He makes me feel like the most beautiful woman in the world. I know in my heart we belong together and we won’t stop fighting until we can be together as husband and wife. We won’t let this break us. “I was so determined to get him a visa I hired lawyers to fight for us. I’ve since visited him twice. Angela had been single for six months following a 16-year relationship when she was contacted out of the blue by CJ. Angela says: “After my relationship ended, I felt lonely. We had become more like friends than partners so we had decided to split. “After being single for six months, I saw a gorgeous young man had sent me a friend request on Facebook. “I did wonder why he had added me but I accepted and he sent me a message telling me how lovely my profile photo was. “He was so handsome, with big, brown eyes and a body to match. I didn’t see the harm in striking up a conversation with him. “We chatted for hours about our families and hobbies. It was like we’d known each other for years. Before I knew it, we were messaging daily. She knew the age gap might be frowned upon but she could not help falling for the computer engineer, who lives in the city of Owerri. Angela, who has sons aged 50, 47 and 43, says: “Despite our huge age gap, we got on really well. I couldn’t help it and began to develop feelings for him. I tried to stop myself. "He was six years younger than my oldest grandchild. But I couldn’t help falling for him. “When I first told my son Malcolm about CJ, he was worried it might be a scam, so he checked him out online. “After seeing how squeaky-clean his social media was, he felt he was genuine. They could all see how happy I was. Just a month after they started messaging in February 2015, Angela’s long-distance lover popped the question over Skype. Angela says: “I was so taken aback when he asked me to marry him. I thought he was joking. But he told me he wanted to spend the rest of his life with me. Angela started planning her trip to Nigeria and bought a stunning blue dress for the wedding ceremony, which CJ had arranged for the following month. Angela says: “CJ had planned the whole day and had bought us both wedding rings. Sadly, none of my family could make it as it was such short notice. But I felt happy to have their blessings. “The six-hour plane journey felt like a lifetime. I was worried CJ might not like me in person. But the moment I saw him waiting for me I knew I’d made the right decision. I gave him a hug and he kissed me. 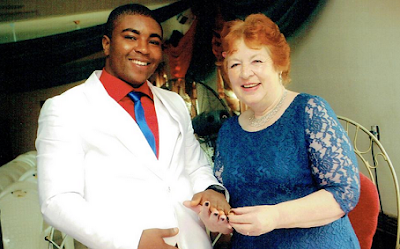 In April 2015 Angela wed CJ in front of his friends and family at a register office in Lagos. Angela says: “The ceremony was so beautiful and CJ had organised it all perfectly. It was the happiest day of my life. 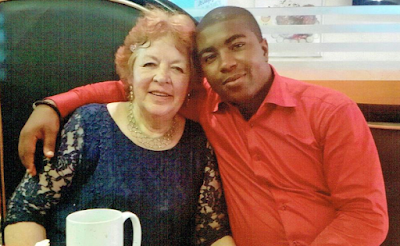 Angela was shocked when her visa application for CJ was rejected and he was denied entry to the UK. She says: “The Visa was rejected because officials didn’t think we had financial backing, as I was retired. "Over the following months I tried again and again to appeal the decision. It broke my heart every time it was denied. He wasn’t even allowed to visit me on a tourist visa. She adds: “I know there are scam marriages and they get hold of older people like me. But they find out if you have money first. “I told CJ from the beginning I haven’t any money. But he told me, ‘It’s you I want’. Since marrying, Angela has visited her husband in Nigeria twice, once in March 2016 for three weeks and once in January 2017 for three weeks. She still hopes to be permanently united with him. She says: “Our only hope now is that CJ will be allowed to come next year on a student visa to study his Masters in computing.